Agriculture in the time of rural distress! Why mainstream media ignores the agri sector? Or, for that matter, issues in rural development? that high strung prose brimming with much rhetoric drew readers. That was in itself a great contribution to point journalism. But you see we are in India and we don’t have that luxury of the British media, in particular, the famed Guardian newspaper which for a very long time used to have a special correspondent who wrote a regular column about the countryside. But then the British has some snobbishness, they used to imagine the very paradise in the greenery of the countryside. But we then live in the Indian villages and where there is much illiteracy still and much poverty and very much social segregation. This media is very much village based and village attached, we write not from the capital Delhi but from the rural interior in the South. So, what we write might not have much relevance in the North and yet we know much of the Indian countryside ,from Rajasthan to West Bengal to much else in the rest of the country where ,we believe, the reality is much the same. Now, when the rural migration, from the rural countryside to the urban centres have changed the picture of agricultural realities. UP and Bihar are two big states contributing to heavy migration, now even the reality is so changed that much of the migrants from Assam and Bengal to the South has created little islands of mini-Assam as in Kerala and in Karnataka. The population diversity is now very fast changing to create almost permanent employment in major cities in many new industries, from hotels and catering to domestic help to many other sectors. The net result is that even in the older states like TN and AP and other Southern states that there is an acute scarcity of labour, more so the farm labour and the term landless labour is not to denigrate in any manner the grip realities of life in the villages. The point here is that those urban-based newspapers and magazines, some are also in the regional languages and yet they have to function from urban point openly write as though the rural India is what they present in their writings. No, this is not the total reality! 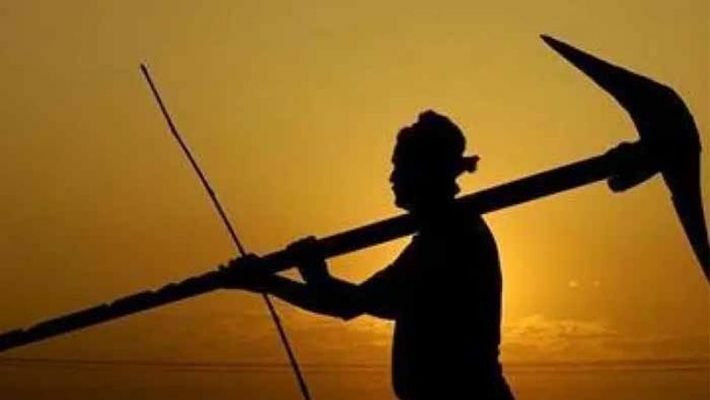 Even the small and marginal farmers with one or two acres of land find it hard to do agriculture for there is no labour available to work on the land. The youngsters had gone away. They are urban-based now, for there is work only there. There is no chance to live back in the village and find year-round work on the small patches of land, mostly dry lands, and also the current realities of demand and supplies in farm products, vegetables and other short-term crops where the price fluctuations are so common that there is no chance for a secure livelihood in the villages. So, what the urban readers are given as farm news is that only patchy distress stories. So, the news that 92 farmers died from suicide across the Rajasthan state on the eve of the Assembly elections is no news, more so when the statistics where three died in the Hadoti region in the Baran district and also the news item is so heroic, with the local suicide helpline, Hope Helpline at 0744-4333666 is like adding more irony to the distress stories elsewhere. After all how many such stories you can carry in a day when there are other items that are more glamorous that is needed to engage the busy readers! So, who will summarise and articulate the farming stories and also who would take up the cause of championing the farmer’s priorities, the rural priorities. It looks agri media business to seem hopeless. How can you compete with the larger media houses, why even the larger ones are struggling already? The government in the States and at the Centre have big ad budgets but then they have their own priorities. The PM, the CMs have to advertise their own programmes and also ask for votes and so we at the agri media are almost in a hopeless situation! So, where is our chance to survive? The big corporate in their pursuit of profit-seeking have their own priorities, so they have their Corporate Social Responsibility (CSR) obligations, they look to the ruling party and allot their funds! So, we have to survey it seems with our wits, so to say and unless there is a growing awareness among the wider society, the more enlightened sections of society, all talk of reviving vigour in agriculture and the food sectors, in order to raise Indias score in the Global Hunger Index and also on the Human Development Index would continue to be a lost cause! So, we invite sensitive readers whoever they are, big or small, to take some extra interest, some commitment on the part of policy makers, to join us in the mission of sensitising public opinion. Agriculture is such a top priority that needs no further labouring of the same points. Agriculture is so part of the global concerns from environment to climate change to pollution etc. Food shortage is also, great many minds have warned us ,m looming food crisis in the year 2050 is very likely, with the population growth threatening our very survival. So, this is a journal for much thought and reflection. Goodbye!